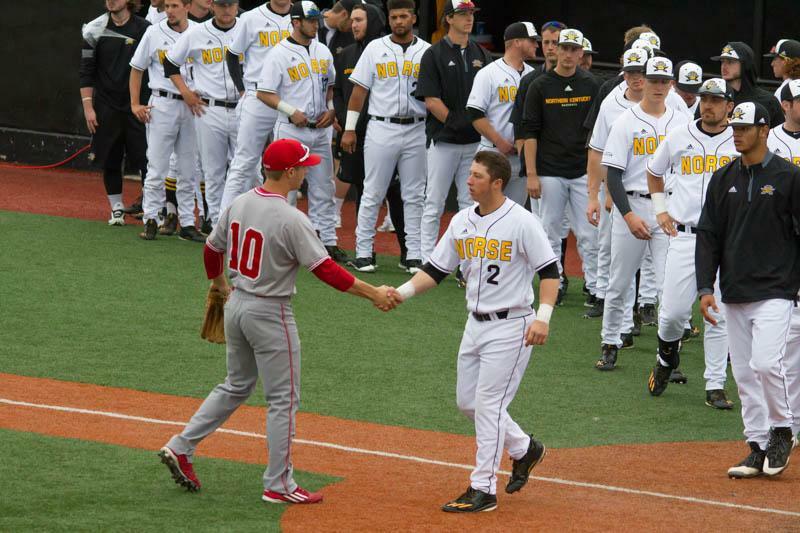 Kyle Colletta (2) and Brooks Urich (10) shake hands in front of home plate. 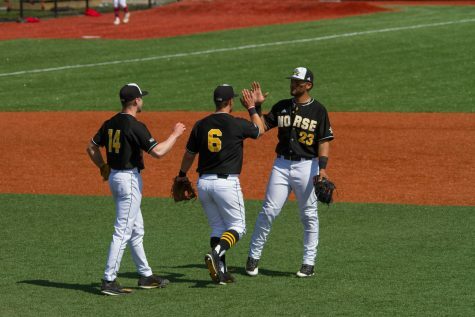 HIGHLAND HEIGHTS, KY– The Northern Kentucky Norse fell to the Miami Redhawks 5-4 after holding a lead for the first seven innings. The loss puts the Norse record at 8-14 while the Redhawks move to 6-16 on the season. The Redhawks scored four of their five runs via the long ball, including the two homeruns from centerfielder Dallas Hall, who tied the game with a longball in the seventh and the game winning homerun off Norse closer Cameron Ross in the ninth inning. 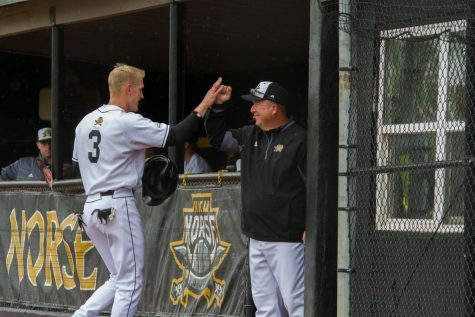 Head coach Todd Asalon was disappointed to see his club give up a lead like that after beating the Redhawks just six days earlier with the same type of comeback. 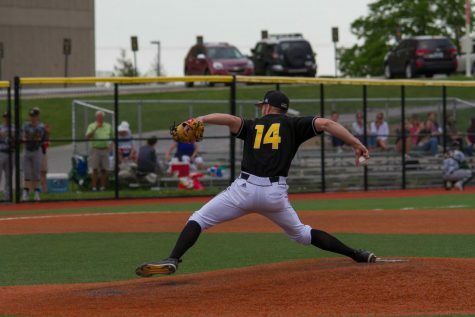 Junior starting pitcher Brody Basilone would get a no decision after throwing 5.0 innings of four hit, three run baseball. He was able to retire the first nine batters he faced. 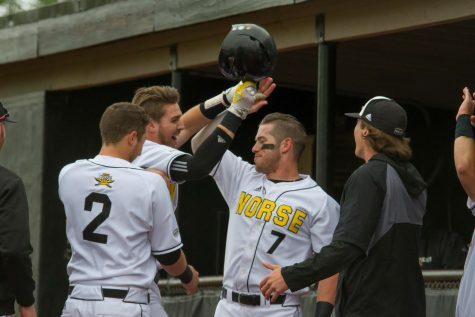 Cameron Ross earned the loss for the Norse, after allowing the homerun in the ninth inning to Hall. 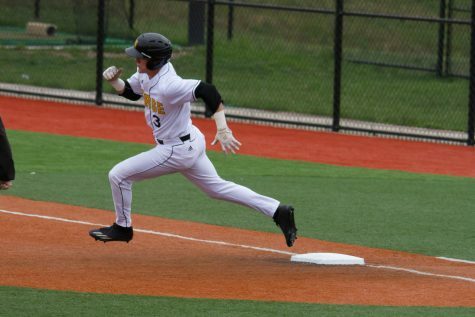 Centerfielder Mike Moffatt went 2-4 with an RBI while Chad Roberts collected to RBI for the Norse. After Redhawks starting pitcher Cole Gnetz allowed four runs in three innings of work, Bailey Martin pitched 5.0 innings and allowed just three hits while striking out seven Norse batters to earn his first win of the season. Nick Ernst earned his second save of the year for Miami. Hall finish 2-4 at the plate while first baseman Ross Haffey went 2-4 with two RBI and a run scored. 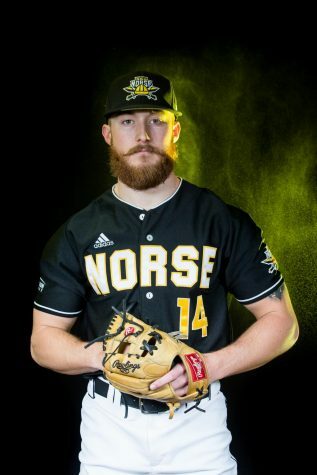 A two-run double from Roberts allowed Will Haueter and TJ Alas to cross the plate in the first inning, putting the Norse up 2-0. 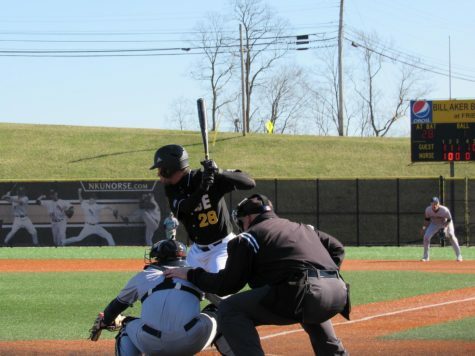 A pair of hits from Kyle Coletta and Moffatt allowed another run for the Norse in the second, putting them up 3-0. Dominic Mercurio gave the Norse a 4-0 lead in the third with his first homerun of the season. That, however, would be the last time the Norse would score. The Redhawk comeback started with a two run homerun from Haffey in the top of the fourth inning to cut the Norse lead in half. 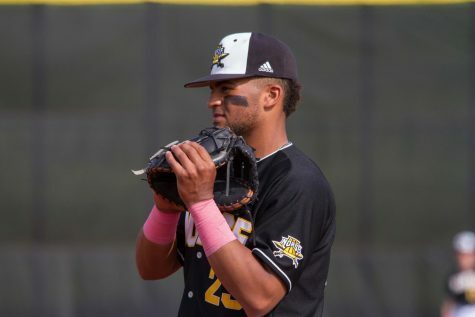 A sacrifice fly from Landon Stephens in the top of the fifth scored Tyler Harris to make the score 4-3 before Hall’s homers later in the game. The Norse will travel north to play Dayton tomorrow afternoon before starting a weekend series with Youngstown State on Friday. Sophomore catcher Will Haueter, who is the youngest player in the starting line up, went 1-4 with a run scored against the Redhawks. After a stand out season in 2016, he has started the 2017 campaign hitting .280 with 11 RBI and three doubles. 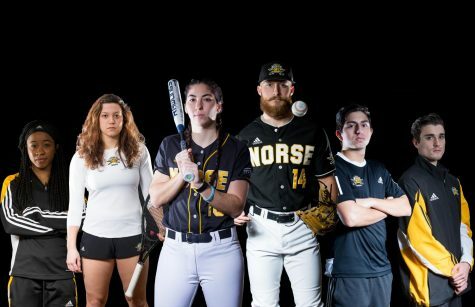 A relaxed stance seems to work for Haueter, as last year he led the Horizon League in doubles as a freshman.